NB hotel is a popular hotel in Riga and during the last 10 years people from all over the world have chosen to stay in NB hotel. Personal attitude is one of the most important reasons why our guests return to NB hotel again and again. 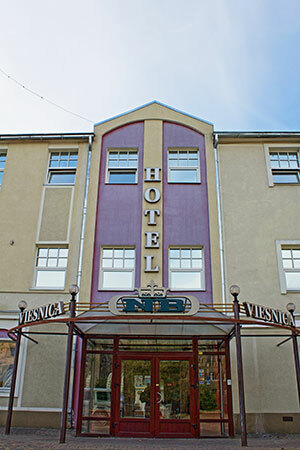 NB hotel is just 15 minutes with a public transportation to Old town and 15 minutes to Riga national airport. NB hotel is a complex of 3 separate buildings and offers our guests 72 comfortable rooms for different tastes and requirements. The hotel is suitable for individual tourists and also groups as the hotel has spacious free parking place for buses and cars. On the 2012 year rooms in the main building were renovated and there were installed air conditioning system. On the hotel`s first floor is located NB Hotel Restaurant where you can enjoy different popular European cuisine dishes. Restaurant have a space to serve up to 150 people at the same time. Restaurant is specialized on organizing and serving group dinner, banquets and corporate events. NB Hotel has a conference hall for organizing conferences or seminars with all necessary equipment. For this reasons we have special Coffee break, Lunch and Dinner offers.